A bear market is a condition in which securities prices fall 20 percent or more from recent highs amid widespread pessimism and negative investor sentiment. Typically, bear markets are associated with declines in an overall market or index like the S&P 500, but individual securities or commodities can be considered to be in a bear market if they experience a decline of 20 percent or more over a sustained period of time - typically two months or more. The U.S. major market indexes fell into bear market territory on December 24th, 2018. The last prolonged bear market in the United States occurred between 2007 and 2009 during the Financial Crisis and lasted for roughly 17 months. The S&P 500 lost 50 percent of its value during that time. Bear markets can last for multiple years or just several weeks. A secular bear market can last anywhere from 10 to 20 years, and is characterized by below average returns on a sustained basis. There may be rallies within secular bear markets where stocks or indexes rally for a period of time, but the gains are not sustained, and prices revert to lower levels. A cyclical bear market can last anywhere from a few weeks to several years. The term “bear market” is the opposite of a “bull market,” or a market in which prices for securities are rising or will expect to rise. It is named for the way in which a bear attacks its prey — swiping its paws downward. This is why markets with falling stock prices are called bear markets. Just like the bear market, the bull market is named after the way in which the bull attacks by thrusting its horns up into the air. The causes of a bear market often vary, but in general, a weak or slowing or sluggish economy will bring with it a bear market. The signs of a weak or slowing economy are typically low employment, low disposable income, weak productivity and a drop in business profits. In addition, any intervention by the government in the economy can also trigger a bear market. For example, changes in the tax rate or in the federal funds rate can lead to a bear market. Similarly, a drop in investor confidence may also signal the onset of a bear market. When investors believe something is about to happen, they will take action — in this case, selling off shares to avoid losses. Bear markets usually have four different phases. The first phase is characterized by high prices and high investor sentiment. Towards the end of this phase, investors begin to drop out of the markets and take in profits. In the second phase, stock prices begin to fall sharply, trading activity and corporate profits begin to drop, and economic indicators that may have once been positive start to become below average. Some investors begin to panic as sentiment starts to fall. This is referred to as capitulation. The third phase shows speculators start to enter the market, therefore raising some prices and trading volume. In the fourth and last phase, stock prices continue to drop, but slowly. As low prices and good news starts to attract investors again, bear markets start to lead to bull markets. A bear market should not be confused with a correction, which is a short-term trend that has a duration of fewer than two months. While corrections offer a good time for value investors to find an entry point into stock markets, bear markets rarely provide suitable points of entry. This is because it is almost impossible to determine a bear market's bottom. Trying to recoup losses can be an uphill battle, unless investors are short sellers or use other strategies to make gains in falling markets. Between 1900 and 2018, there were 33 bear markets, averaging one every 3.5 years. One of the most recent bear markets coincided with the global financial crisis occurring between October 2007 and March 2009, during which time the Dow Jones Industrial Average (DJIA) declined 54 percent during the period. As of December 2018, some forecasters predict that we're headed toward another bear market. Investors can make gains in a bear market by short selling. This technique involves selling borrowed shares and buying them back at lower prices. It is an extremely risky trade and can cause heavy losses if it does not work out. A short seller must borrow the shares from a broker before a short sell order is placed. The short seller’s profit and loss amount is the difference between the price at which the shares were sold and the price at which they were bought back, referred to as "covered." For example, an investor shorts 100 shares of a stock at $94. The price falls and the shares are covered at $84. The investor pockets a profit of $10 x 100 = $1,000. If the stock trades higher unexpectedly, the investor is forced to buy back the shares at a premium, causing heavy losses. A put option gives the owner the right, but not the obligation, to sell a stock at a specific price on, or before, a certain date. Put options can be used to speculate on falling stock prices, and to hedge against falling prices to protect long-only portfolios. Investors must have options privileges in their accounts to make such trades. Inverse ETFs are designed to change values in the opposite direction of the index they are tracking. For example, the inverse ETF for the S&P 500 would increase by 1 percent if the S&P 500 index decreased by 1 percent. There are many leveraged inverse ETFs that magnify the returns of the index they track by two and three times. Like options, inverse ETFs can be used to speculate or protect portfolios. 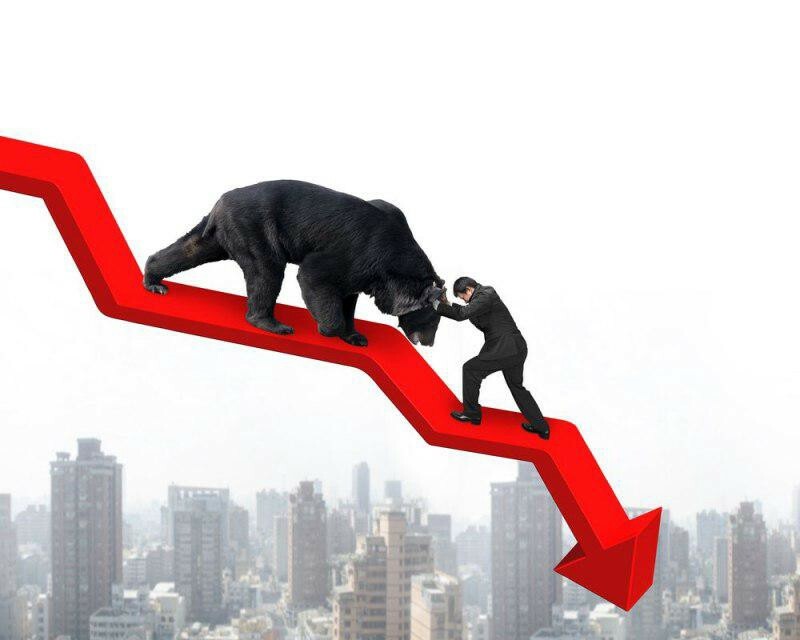 Bear markets are markets in which the prices of securities falls by more than 20 percent amid widespread negative investor sentiment and fear. ﻿Bear markets can be cyclical or secular. The former lasts for several weeks or a couple of months and the latter can last for several decades. Short selling, put options and inverse ETFs are some of the ways in which investors can make money during a bear market. The ballooning housing mortgage default crisis caught up with the stock market in October 2007. Back then, the S&P 500 had touched a high of 1565.15 on October 9. By March 5 2009, it had crashed to 682.55 as the extent and ramifications of housing mortgage defaults on the overall economy became clear. Other examples are the 1929 Great Depression. The aftermath of the bursting of the dot com bubble in March 2000, which wiped out approximately 49% of the S&P 500's value and lasted until October 2002, is another example. They just have the weirdest names for things in the stock trading business. I get confused with all the animal names and their connotations. Do you have any tricks for remembering them?